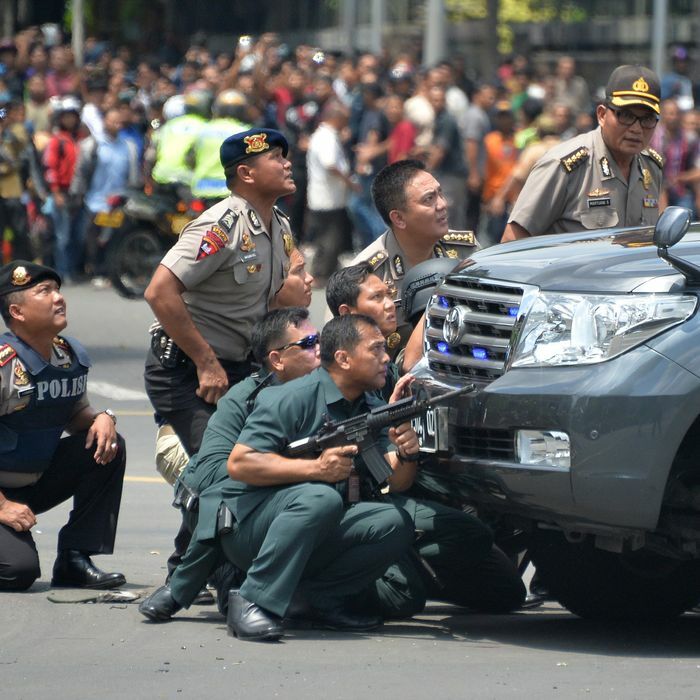 Indonesian police take position behind a vehicle as they pursue suspects after a series of blasts hit Jakarta. Good morning and welcome to Fresh Intelligence, our roundup of the stories, ideas, and memes you’ll be talking about today. In this edition: terror in the streets of Jakarta, more trouble for Ted Cruz, the government finally takes an interest in the wealthy, and Waffle House employees take hygiene too far. Here’s the rundown for Thursday, January 14. Americans learned on CNN today that Al Jazeera America will shut down by April 30. Analysts are predicting that more than 700 staffers could lose their jobs. Though the television network is folding, Al Jazeera has pledged to expand digital services in the U.S.
Two Waffle House employees in Forest City, Arkansas, have been fired after being caught on film washing their hair in the restaurant’s cookware, in front of costumers, during service hours. Apparently they get no points for cleanliness. The sixth GOP debate airs Thursday night on the Fox Business Network. The whole gang’s back, minus Rand Paul, who’s decided to throw a fit rather than participate in the undercard debate.